This year, Discover Nikkei collected stories from around the world related to the topic of Nikkei food culture and its impact on Nikkei identity and communities through a project called ITADAKIMASU! A Taste of Nikkei Culture. The following article was chosen by the ITADAKIMASU! Editorial Board as one of its five favorites. To read more stories from the series, click here. My mother came to Brazil when she was three years old and since childhood learned to eat all that nature could offer, already being able to tell what was edible. Even geckos, nine-banded armadillos; in short, just about anything that appeared in front of her. She was married at the age of 14 and a short time later went to live in a small farm in the town of Bastos. I remember how she prepared everything with simple seasoning like salt, garlic, lime, pork fat, leek, and ginger. Everything she cooked turned out to be delicious. My father had a refined palate and gave my mother many suggestions, for she was still very young. He knew how to make tempura with tender carrot leaves, which was very crunchy because he mixed in cachaça [Brazilian rum; “our whisky”] with the flour. They used everything available: in my mother’s hands, whatever they could find in the woods was turned into a dish. I miss those days very much. There was a weed called picão that was abundant in the area and that today is used as a medicinal herb. Well, for my mother the softer picão leaves were a substitute for horenso [spinach], which was unavailable at that time. She made an ohitashi that we all liked, seasoned with sumiso (miso, lime, and sugar). Her fukujinzuke preserve was special: made in large quantities to be divided among her children, all married, and using the season’s vegetables. It took a week for it to be ready and the result was a mix of crunchy legumes that, just thinking about it, makes my mouth water – these days, I don’t know anyone who makes as tasty a preserve as hers used to be. Carrots, chayote, eggplant, daikon, gobo, all cut into little cubes. On the first day, they were preserved in salt, with an omoshi on top; the next day, she squeezed the legumes to remove their moisture, tossing it out. Separately, she made a broth consisting of dried fish, seasoned with shoyu and sugar. After removing the broth from the fire, she waited for it to cool down and then mixed the broth with the legumes, adding to the mix a kind of pepper we call “lady’s finger” [a type of chili that isn’t too spicy]. At night, she put the omoshi back in place until the next day. She repeated this procedure during the course of five consecutive days. Each morning, she removed the omoshi, squeezed the broth out of the legumes so that only the broth itself went into the fire, and on the last day, if necessary, she added shoyu or sugar or water. Once the broth cooled down, she again mixed it with the legumes – and Mrs. Shizuka’s crunchy fukujinzuke was ready. It was then stored in glass jars where it could stay out of the fridge for six months without losing its flavor. The miso my mother made was just too good; it was also made in large quantities to be distributed among her nine children. She made it once a year until the age of 85. She stopped making it only because it became too difficult for her to do this manual task which required strength. All I know is that the grandchildren loved the misoshiru made with “obaachan’s miso.” When it came to the miso bought in the supermarket, even if they didn’t know where the miso had come from, none of them could eat it, such was the difference. At first, her miso was light-colored, but with the passing months it became both increasingly dark and flavorful. Now I will tell you how my mother made her special misoshiru, the real ofukuro no aji. First, she cut off the meatier parts of the chicken and set them aside for other dishes. She then rubbed lime on what was left of the chicken so as to remove its peculiar odor, and washed it thoroughly. Following that, she prepared the broth, boiling it along with diced onions in a covered iron skillet until the bones became soft. 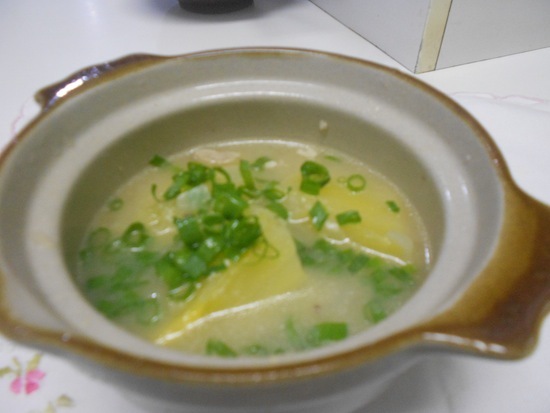 Next, she put large slices of peeled cassava into the broth. (Preferably yellow cassava, which was more flavorful and widely available in the area.) She heated the mix until the cassava softened, while making sure it didn’t actually melt. At the end, she added the miso and, after bringing it to the boiling point, turned off the fire. When it was meal time, she poured the broth into individual bowls, with the bits of cassava and leek on top. It was delicious when hot, especially in wintertime. Today, as I no longer have the privilege of having “obaachan’s miso” at home and I lack both my mother’s patience and ability, when I make misoshiru I must add aji-no-moto and other things to enhance its flavor. For those who like to experiment, I recommend you strain the broth before adding the cassava. When I decided to take part in ITADAKIMASU!, I rounded up all the ingredients and made my mother’s special misoshiru. I became overwhelmed with emotion and happiness because I was then able to reduce a little the feeling of missing my mother, as in September it was Sankaiki (2 full years) since she left us at the age of 95. 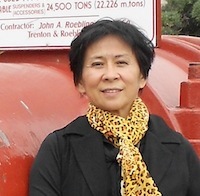 Rosa Tomeno Takada was born in Bastos, one of the cradles of Japanese immigration. She is the mother of two girls and two boys, and a dedicated grandmother of three. She likes eating better than cooking, though her youngest son’s hobbies are both cooking and eating well. In her garden she has a sakura and each year she waits anxiously for the first buds to blossom. She has been an Evangelical Christian since the age of 18 and her biggest joy is to sing, praising God. Discover Nikkei, a project of the National Museum, is an award-winning multi-lingual site that shares the stories of Nikkei around the world. To see the ITADAKIMASU! Editorial Board's response to this story, visit Discover Nikkei.